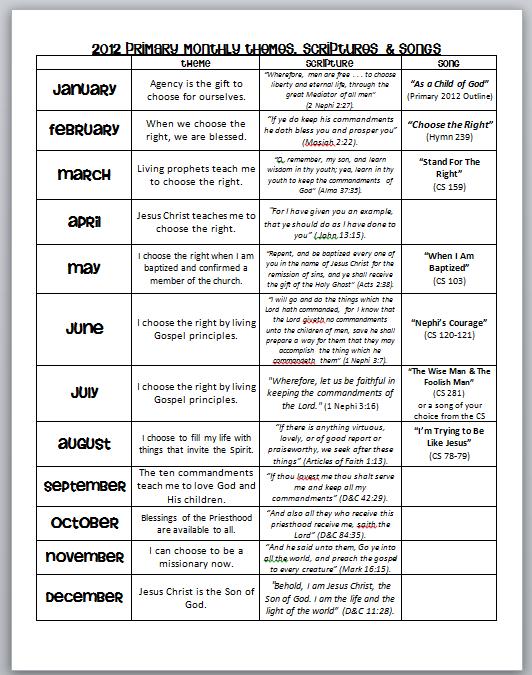 Yesterday I asked if anyone would be interested in my Yearly info (song, scripture, & theme) sheets. I’ve only had 1 person say ‘Yes’ so far, but I figured I’d go ahead and make them. I already had mine from last year, so it didn’t take as long. There are 2 sheets in this document. The first one is each month’s Theme, Scripture and Song. The second sheet is each month’s weekly themes. Just print them out and put them in your folder and you’re set! I have a link for the PDF version of my file and also a link for the Microsoft Word file. Just click on the link for the Microsoft Word file and then at the top click ‘Download‘. Once the file is downloaded you will be able to make any changes needed. Thanks for the handy one page summaries–perfect for a chorister to keep at the ready as I prep each week. Thank you! The last presidency had these in their folders and I found the site on it. I appreciate that you took the time to get these ready for anyone to use. Thanks!! I actually just recently found your site so I wasn’t sure what you were asking about. 🙂 Glad you shared it! I’ve just printed mine and now sending you my thanks! This is a great help. Happy day. Oooo, thank you! I just found your site from pinterest, and love it already!